Guard rails are required for platforms over 10' in height. Note: No more than 2 employees shall occupy any given 8 feet of a carpenter's wall bracket scaffold at any one time. As recommended, OSHA requires carpenter's wall bracket scaffolds to have guard rails, mid-rails and toeboards. 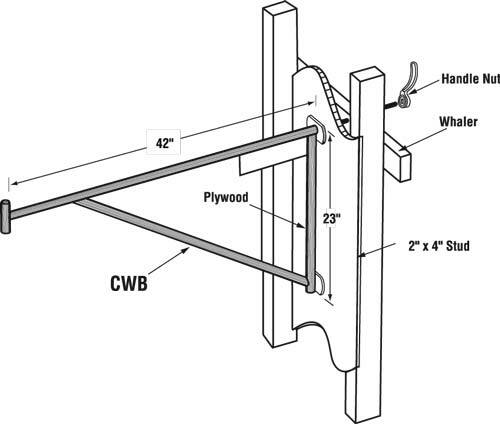 Platform load on any wall bracket should not exceed 500 lbs. Platforms using 2" X 10" wood plank and 2" X 4" guard rails are limited to a maximum spacing of 8 feet between brackets. Click the button below to add the CARPENTER WALL BRACKET to your wish list.